When a nominee is this polarizing, might be time for a new nominee. We do know that for sure. He mischaracterized his drinking and hard-partying ways, painting himself almost as a "goody two-shoes." Numerous people who knew him at the time have publicly disagreed. I don't think what a person did in high school is necessarily applicable for a job consideration at age 50-something. He might have started with something like (condensed version) "I was a hard-partying teenager in high school, and certainly if I had it to do over again I would conduct myself differently. I don't recall ever meeting Dr. Ford, nor do I recall an incident similar to what she described. However, if I did anything that harmed anyone, I sincerely regret it." But a flat denial of what his life was during that time, coupled with a level of rage and disrespect he wouldn't tolerate in his own court pretty much indicates he's still the same guy he was in high school. I can see it after a thrash metal or cowboy music show, but it takes a seriously aggressive drunk to turn a UB40 concert into a reason to fight. Not being a seriously die-hard con or lib, I don't know. I ceased delving into politics several years ago. And I never spent every waking moment gushing over some political figure while surfing the web looking for poop to smear on some opposing figure. We'll let the chips fall where they may. I've stated my piece. ... Whatever one thinks of the sexual assault allegations, Kavanaugh remains a serial liar (under oath!) and anti-American extremist. It sure isn't looking good for him, is it? Anyone know of a store that sells crow? Kudos, though I'm not sure what it takes to sway the GOP. Interesting, thanks. There are some serious questions floating around about how thorough the FBI is being. A former classmate of the Supreme Court nominee has reached out to the FBI but hasn't received a response. Leaving aside matters of opinion, if some of the hard evidence about Kavanaugh that's appeared in the media is not in the FBI report, GOP Senators may feel they have the political cover to vote to confirm. And you never held the opinion during the O. J. murder trial that he was guilty? And I suppose that you now support his innocence? As Bret ruled the FBI has the right to do when someone is suspected of lying. Planned Parenthood still thinks that Sen. Heidi Heitkamp (D-ND) is a question mark. It's asking us to ask our friends in these states to make the calls. Are we really going to have a SC justice forever to be called Boof Kavanaugh? Will he ever rule (vote) unfavorably toward trump? Will trump call him Boof, if he does? Will we have a Boof Kavanaugh thread? 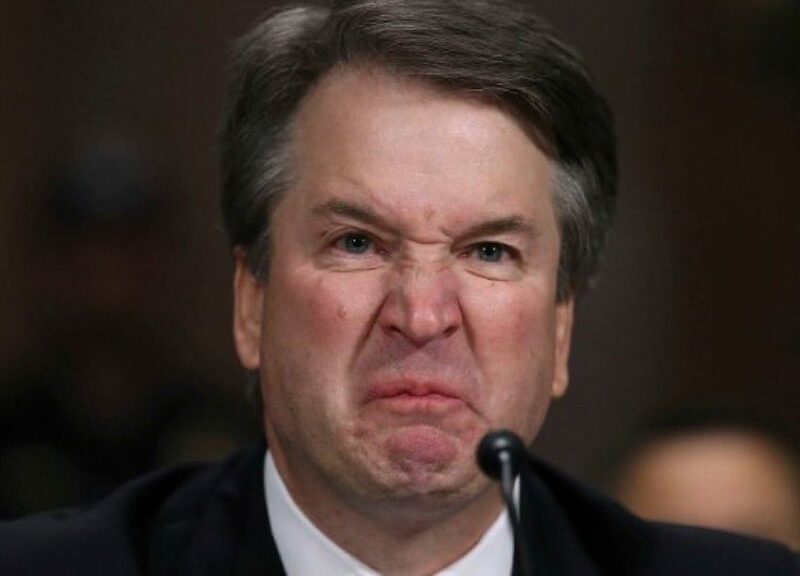 Will spell check automatically suggest Kavanaugh after I type Boof ? Why yes it certainly does. Any bets on whether the streets will erupt in protests and mayhem should Kavanugh be nominated? Sen. Jeff Flake (R-AZ) - Yes. Sen. Lisa Murkowski (R-AK) - No. Planned Parenthood still thinks that Sen. Heidi Heitkamp (D-ND) - No. - is a question mark. It's asking us to ask our friends in these states to make the calls. So, it comes down to Collins and Manchin. Either they both vote 'No', possibly tomorrow, or he's confirmed. Collins and Manchin both voted 'YEA'. Final vote is tomorrow. My guess: No violence at all and Leo Lyons is just being a Henny Penny. Women's, civil liberties and green groups rarely get violent and I'm unaware of violence over any SCOTUS pick, ever.